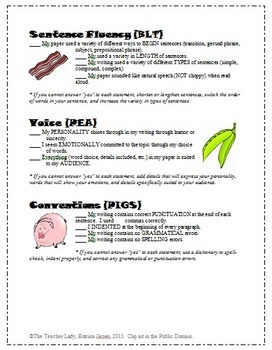 This Revision Checklist focuses on the 6 Traits of Writing. 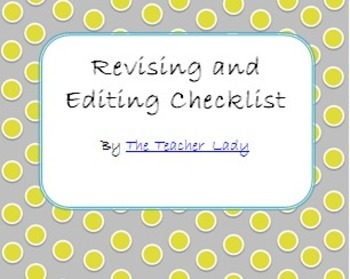 As introduced in my 6 Traits of Writing PowerPoint, the revision checklist breaks each trait down into manageable elements for which students can easily revise. For example, under Ideas & Content, students revise to make sure their writing is FIDO - Focused, Interesting, Detailed, and Original. Students check off a characteristic after they have finished revising for it. The checklist also gives suggestions for improving each trait. 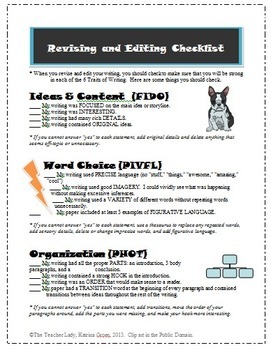 This is a great checklist for revising general writing projects!